Create perfect images of engineering drawings, documents and associated metadata and upload into your database. Remote and local offices, vendors and customers, can create and transmit perfect images, complete with metadata attribute tags, directly into your central data management system. Users, anywhere on the internet or intranet, simply 'print' to Trix ImageMaker. Output is PDF, TIFF, CALS, JEDMICS C4, PNG, etc., delivered to a specific user or directly into a document management system. User defined metadata attribute tags are collected simultaneously. Create images from virtually any Windows application, CAD and non-CAD. These are not low-resolution screen shots - the images you get are exactly what you see on screen with really legible detail. Captures hidden lines, foreign fonts, exact projections. System Requirements: Server requires Windows Server 2008 or 2012. Clients require Windows 10, 8 or 7. 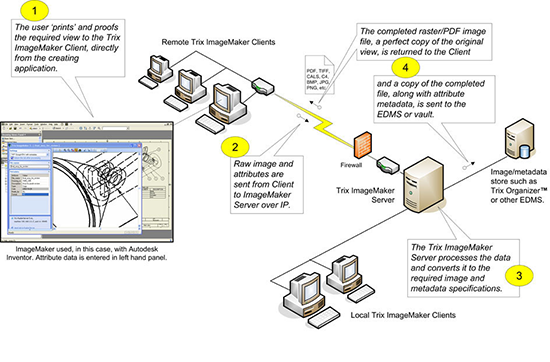 Comparison with Trix RasterServer: Choose Trix ImageMaker when you have formats not natively converted by Trix RasterServer and/or you need to collect metadata attributes about each image.